If you aren’t buying into a “Nexus delay” that we have talked about time and time again over the last week, maybe this will help. 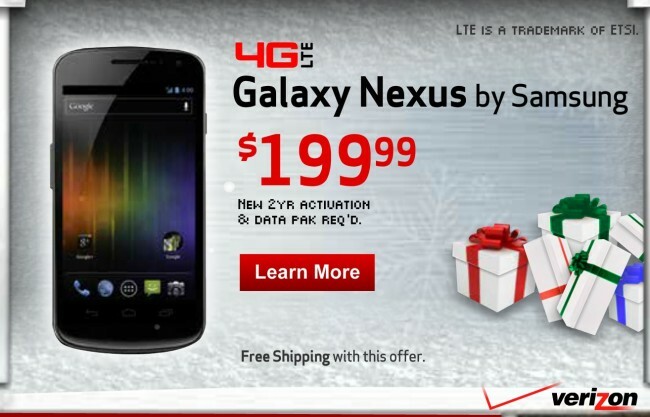 According to an ad campaign that is running across a variety of sites who are a part of the NetShelter ad network, the Galaxy Nexus should have already been available to the public and on-sale for Black Friday (today) at the low price of $199 on 2-year contract ($100 cheaper than the expected $299 price). So you know, Verizon runs almost all of their major marketing campaigns through NetShelter, so this isn’t just some random network putting out a Black Friday deal to grab attention. This was going to be one spicy deal. But now, thanks to unconfirmed reasons, the phone won’t be available today. The latest date we have seen from Verizon is December 8. Will we be dancing in G-Nex juice come that day? We’ll just have to wait and see. Update: As some have requested, we should talk more about the significance of this price. Has Verizon seen the light and decided to offer their first 4G LTE Android 4.0 device at just $199? Maybe. Was this a Black Friday deal only? Maybe. Is this the 16GB version at $199 with the 32GB version still dropping in at $299? Could be a possibility too. There is no way to tell from this ad. Would be nice to see this price stick for good though, wouldn’t it? View the ad here and embedded below.